OK, floralpreneurs…..can I get real for a minute? I LOVE being a floral designer. Love it. It was my first job, it’s been my only real job for 24 years!….but the reality of the environmental impacts of floristry are pretty ugly. From the pesticides that growers and florists are exposed to, to the monocultures that produce them, to the plastic packaging, to the transportation and distribution, to the preservatives added to the water to extend longevity, to the floral foam, to the “waste”….well, this is all “less than pretty”. So what can we do to be more eco-friendly in our business? Let’s pledge to do more this year with a Go Greener Challenge!…You in? Even if you’re not 100% green, what can you do to get 1 or 2 or 3 steps closer to green-er? I came up with 8 super easy steps to get us started…..
1. Eliminate or reduce the amount of floral foam you’ll use this year. #nofloralfoam has support on Instagram….it’s not just good for the environment to be eco-friendly, it’s also very fashionable. You can sell your “no foam” approach as a positive. Ariella Chezar is all for the no floral foam approach. Chickenwire, waterproof florist tape and armatures are used in its stead. I attended a workshop with Ariella recently where she was using my friend, Holly Chapple’s, new plastic “egg” or “pillow” which are both now available from Syndicate Sales. It’s an amazing alternative to foam and it’s incredibly versatile. Give it a try; you’ll dig it. 2. Buy locally grown flowers. If you buy locally grown flowers (particularly organically grown!) you’re supporting a local source and voting for the environment with your dollars. Check out Debra Prizing’s Slow Flowers movement! Shopping local is a huge priority for my business. I will pay more for something from a business that’s owned and operated in my state because source matters to me. Whether it’s organic or a purchase from my wholesaler, location matters. Maybe you can get it shipped directly for less….or maybe it’s worth supporting your local supplier! Turn off the sink instead of letting the water run when you’re washing or filling buckets, fix that leaky faucet, reuse water from buckets instead of “just dumping it” once a bucket is empty if it’s only a day old, take any small step toward conservation. I know this is required in some regions and that’s the way it should be! Compost your organic waste. I have a compost pile that’s just for my “business waste”; this pile will not be used on the garden as I’m not exactly sure what pesticides the flowers may have been treated with when they were grown. So I’ll compost them, but I won’t spread it around the yard. Is there a preservative you use to process your flowers that you can do without? Is there 1 chemical you can drop? Even a more earth-friendly cleaning product for your shop is a step in the right direction. 7. Don’t do “not eco-friendly stuff” just because the client wants it! Just think about the environmental impact when people release balloons or light those paper lanterns that were popular until people started seeing the impact on wildlife…if you’re working on a gig make sure it meets an ethical environmental standard that aligns with your vision. 8. Repurpose leftovers instead of tossing them at the end of the week/event. I know that it’s hard to consider yourself “environmentally friendly” if you work in the floristry trade…unless you’re an organic grower and you don’t use any chemicals or pesticides, in which case you’re making huge strides as an eco-friendly florist!…..but for those of us who are “more traditional florists” when it comes to sourcing and methods, we can still take steps to lower our impact once the flowers reach our doorstep. That is always my goal, but I realize I can do even better and try even harder to be more eco-friendly. Maybe you can find ways to take steps to be greener, too. Leave a comment below (scroll down!) 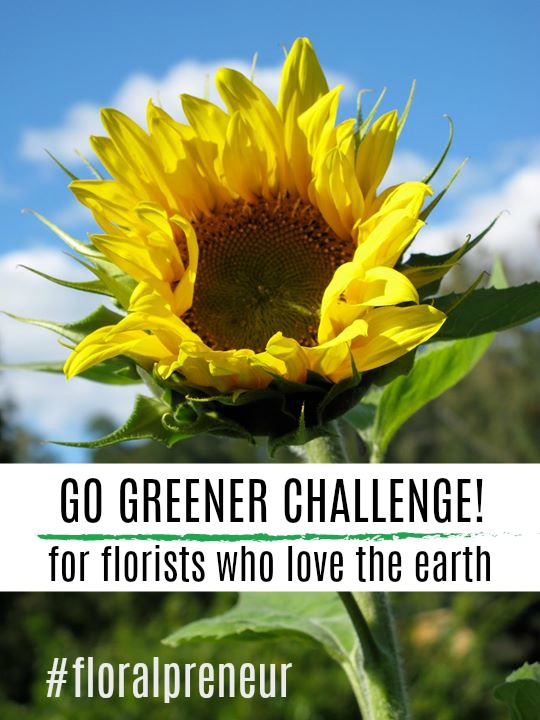 if you want to take the Go Greener Challenge with me! Let’s see what we can do. Today, tomorrow, all year long. Oh, and Happy Earth Day, y’all. Have you tried a free course? Click here for a full list of free course offerings!